Piła airfield (Polish: Lotnisko w Piłe, German: flugplatz Schneidemühl, also known as Schneidemühl West, ICAO: EPPI) was an airfield 330 kilometers northwest of Warsaw. The airfield was established in 1914 as a factory airfield (Industriehafen) of the Albatros Flugzeugwerke, one of the largest aircraft factories in Germany on the northwest side of Schneidemühl. At the time it had only one hangar, one workshop and a couple of accomodation huts. During World War I several more hangars, buildings and workshops were added, allowing it to produce about 100 aircraft per month of a large variety of Albatros, Fokker and Staaken aircraft. It survived World War I and following the Treaty of Versailles Schneidemühl remained a German town. The airfield and the factory were closed in 1920 however, possibly because of the proximity of the new country of Poland.. In late 1939 the airfield was used as a provisional prison for the Polish elites that were arrested in the eastern parts of Germany of in Occupied Poland. In the former Albatros factory, a repair facility for aircraft was opened by the Ludwig Hansen & Co. Reparaturwerkstatt company in early 1940. From 1941 to 1944, the facility repaired Bf 110s, Me 210s, Me 410s and Fw 189s. To facilitate the plant, 2 concrete runways were built in 1943, oriented northeast-southwest and east-west at a length of 1200m. The airfield also had 1 large flight hangar and 2 repair hangars at the southeast corner. The Hansen company complex was off the southeast corner and included 1 flight hangar, 3 large repair hangars and several workshops for the reception, dismantling, repair and reassembly of damaged aircraft. Aircraft parts such as complete fuselages or/and wings were stored along the edge of the surrounding wooded areas. A branch rail line serviced the repair facility and the south boundary. A barracks complex to the southeast of the landing area (south of the hangars) housed French, Belgian and Russian POWs, as well as Polish civil prisoners. A compass swinging base (on the southern boundary) and a shooting range for ground testing of the aircraft weapons (on the northeast boundary) were available. There were 2 dispersal areas: Northwest (on the edge of the woods) and Northeast (in the woods) – with over 25 aircraft parkings. The Hansen company facilities were advanced enough to allow repairs on the early jet aircraft from September 1944 and by the end of 1944 it had become the largest Me262 repair facility in the Third Reich. As Schneidemühl held an important part of the National Socialist defense industry, it became a target. 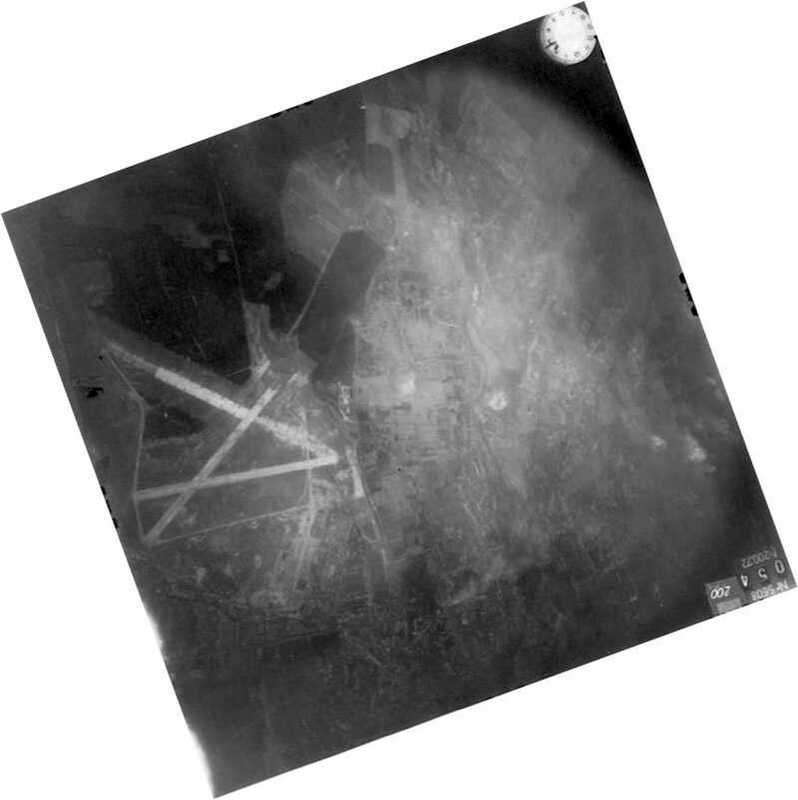 On 29 May 44 the airfield was bombed by 19 B-17 Fortresses as a target of opportunity. The attack did very little damage; bombs hit an unpopulated area south of Schneidemühl. On 21 December it was attacked also: 4 Lancaster bombers of the RAF attacked the airfield as a diversion for Luftwaffe night fighters to protect a fleet of bombers heading for oil industry targets in Pölitz (todays Police, Poland). With the Red Army advancing towards Berlin, the city was turned into a fortress in early 1945. The city was captured after heavy fighting lasting from 24 January to 14 February 1945 by the troops of the 47th Soviet Army. As a result of the heavy fighting, the city (and likely the airfield too) was three quarters destroyed. Flugplatz Schneidemühl photographed on 22 February 1945 (dawna.pila.pl). After the war the German population was expelled from the region and their places were taken by Polish people. The city and its airfield became Polish territory. Between 1952 and 1998 the 6th Fighter-Bomber Regiment was stationed at the airfield. Over the years, the aviation infrastructure was expanded to the north and adapted to handle jet aircraft, operating with Lim-1/MiG-15 'Fagot' and Su-22M "Fitter' fighters. In the 1980s the airfield was extensively modernised. Ultimately it had 26 aircraft shelters for Su-22 'Fitters in the southwest and another 14 in the northeast of the airfield. While most of the airfield is the result of the 1980s refurbishment, some World War II buildings are alledgedly still present. The Polish Air Force left the airfield in 1998. Su-22M 'Fitters' of 6PLMP (Polish Air Force) on the platform (Panoramio). A 'Fitter' making a pass over the airfield (Panoramio). Since 2004 the airfield is for sale. Several investors have taken an interest in the airfield, but so far no plans have materialised. In 2014, Günther Debiscop informed me that currently, Pila airfield is used for gliders and general aviation. Also, there is an active musuem with a former Pila-stationend Su-22M-3 in its collection. A small airshow was held in 2014 to commerate the 100th anniversary of the airfield. 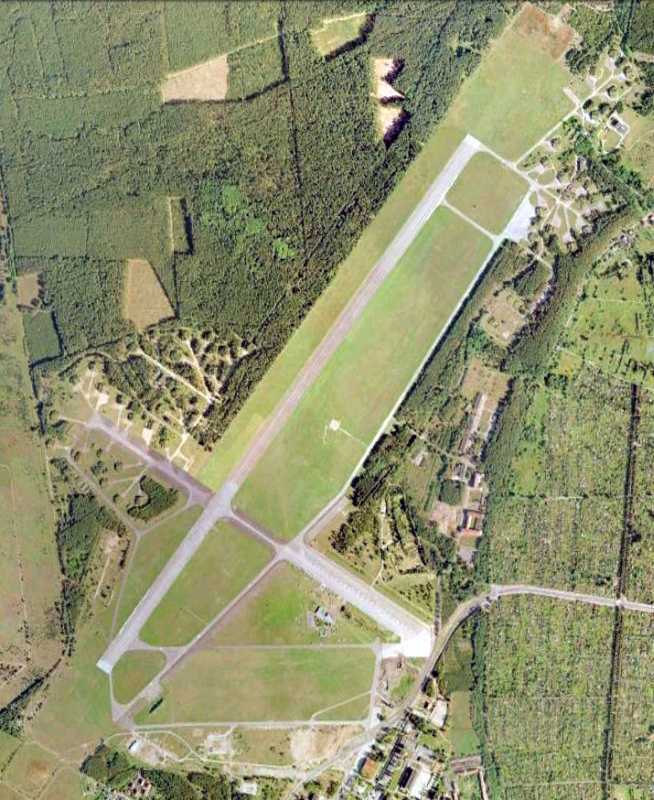 Overview of the airfield in 2008 (Google Earth).